In this increasing age of sub-specialisation in medicine in general and surgery in particular, learning organ specific details for diagnosis and treatment is a challenge to every clinician. 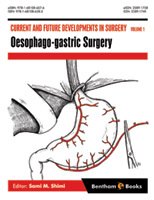 This e-book ‘Oesophago-gastric Surgery’ will therefore come as a welcome addition to the specialist literature on the subject. It has been put together, written and edited by a multi-disciplinary specialist team from Ninewells Hospital in Dundee, Scotland, who have covered the full range of oesophago-gastric conditions and their treatment. The book is meant primarily for surgical trainees, both with a general and specialist upper GI interest, as well as consultants who wish to gain up-to-date knowledge of this area. It goes into great detail in all the areas of benign, pre-malignant and malignant disease. The book is well referenced and provides very clear figures and diagrams to help the reader understand many of the complexities of treatment. While the incidence of squamous cell carcinoma of the oesophagus is falling, and of adenocarcinoma is rising, the management of the pre-malignant condition of Barrett’s oesophagus has therefore, become increasingly important. The role of surgery in the management of gastro-oesophageal reflux and other benign conditions has increased significantly over the last 20 years with advances in minimally invasive surgery. This has brought the medical and surgical endoscopists into a much closer relationship than in the past, with recognition that treatment can now be tailored to the underlying condition and the patients’ needs. The background pathophysiology on which both diagnosis and management are based on particularly useful and is a credit to the editorial team and the authors involved. Overall, this is a well-written, detailed and up to date e-book, which covers all the relevant areas of oesophago-gastric surgery and will be a very welcome addition to the eBook series. The natural evolution of surgical knowledge and technology meant that the traditional general surgeon concept is no longer sustainable. This has necessitated the need for sub-specialisation. Along the route, the influence of volume on outcomes was established. The end result seen today is an endorsement of subspecialisation by all the Surgical Colleges, professional societies and health care systems. “Super specialisation”, is a separate discussion for the coming decade. The traditional textbooks on general surgery can no longer provide the core knowledge for specialist training. This book addresses the core knowledge needs of higher surgical trainees in oesophago-gastric surgery and provides a reference manual for established consultants in oesophago-gastric surgery and other specialties. It provides a practical and user-friendly reference to all relevant topics. A comprehensive but concise approach was adopted to detail the main relevant topics. Detailed discussion of rarer topics was left for the commonly practiced Internet searches. The chapters in this book are practice based. They were written by experienced clinicians who have gone through the sub-specialisation process with full awareness of the specialist educational curriculum specified by the surgical colleges and professional societies. With this book being one of the “e-book” series, it means that busy practitioners can have instant access to this book on the Internet to refresh knowledge and gain additional insight. I am grateful to all the contributors who have shared their knowledge enthusiastically. To our readers, we hope that you enjoy reading this book, enjoy the knowledge riches in its pages and for those who are preparing for professional examinations, we wish you success.